The setting in this story is phenomenal. The way the main character describes the forest before a large part was cut down gives the feeling that you are out in nature. I love the main character Beanie, a Native American woman. 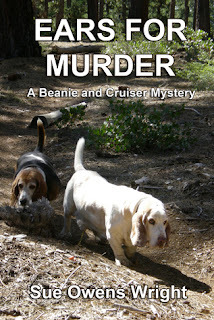 She lives in the woods with her dog, a basset hound named Crusher. She is not happy that the woods around her is being destroyed. However, there is a bigger problem. While baby-sitting her daughter’s dog Calamity she takes the dogs for a walk in the woods. She makes a horrific discovery. One of the men cutting down the tree’s found chained to a tree and he has an arrow in his neck. She doesn’t want the local Native Americans being blamed for this. The sheriff likes to crack jokes that tend to be a little racial. The book is well written and the plot line flows so smoothly. I guessed throughout the entire thing as to who the murderer truly was. This is a well written mystery. This is the fifth book in her series and I ha e decided I must definitely read the other books in the series. This is a book I highly recommend.